The sequel to the enormously popular original Asteroids release of the previous year, the deluxe version adds more to the enthralling gameplay of the original to produce a more challenging and entertaining game. The basic premise of the game remains the same: destroy all the rocks and their fragments to advance to the next, harder stage. As well as the rocks and enemy saucers to overcome, there is the additional threat of a new super ship to battle. This manifests itself in the form of a hexagonal-shaped ship which when shot breaks into six smaller triangular ships which home in on your position. You must destroy these as contact with anything is fatal. In addition to these extras, the enemy UFO's, both large and small, are more accurate with their bullets, so they pose more of a threat and should be disposed of as soon as they appear. 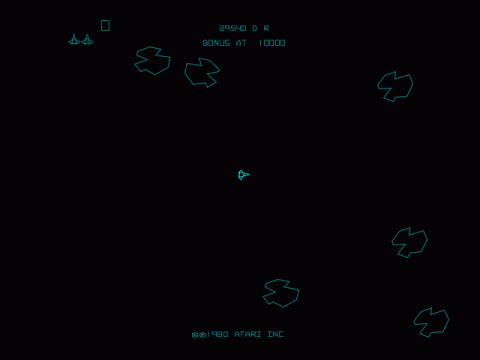 In all, Asteroids Deluxe is basically more of the same. But what there is, is good. The gameplay remains entertaining and addictive, and the game alterations only serve to enhance the already classic game style, where the original set the standard. Scoring: Large Asteroid: 20 points. Super Ship fragment: 200 points. You can use the majority of the same tips as in the original asteroids, but remember that the enemy ships have a better aim, and you have the extra threat of the super ship to contend with.